Here‘s the link. Too late for Christmas, but always a thoughtful gift for the Ellingtonian in your house. This post is for my dear friend Harriet Choice, who always knows the difference. Audrey Baxter and I never met, although we would have had some enthusiasms in common. She had good taste in music and encountered artists I admire, leaving behind a few precious relics. Taking a chance on Google, I found these possibly incorrect shards of evidence from the 1940 United States Census. I say incorrect because hers is a common name, but on April 1, an Audrey Baxter was about 27 years old and was living with her brother Don Haney and his wife Edna on Monteith Avenue in Cincinnati, Ohio. The census-taker noted she was “Female,” “White,” and had been born in Ohio. 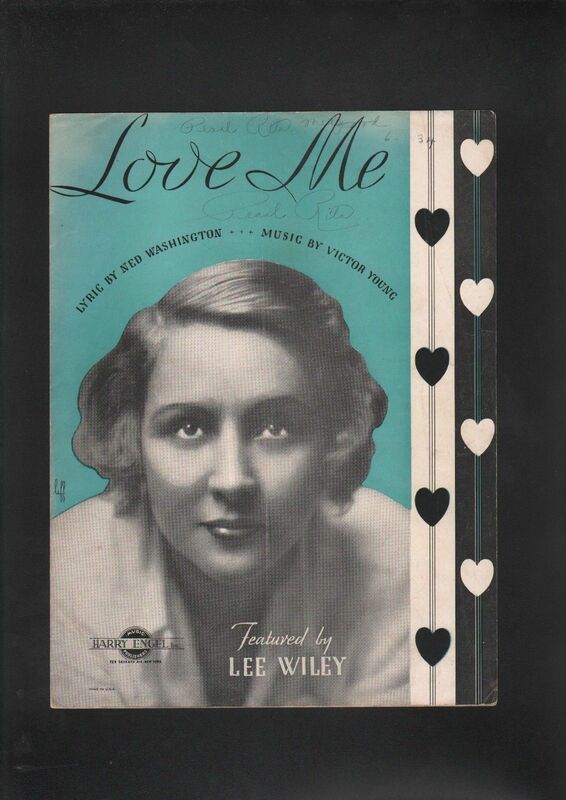 The reason for my new fascination with Audrey Baxter is that she collected autographs from bands and musicians from the Thirties to the Fifties, and a few delights have turned up for sale on eBay. The signatures look genuine to me, and Audrey dated the back of the photographs, presumably noting when she got the autograph and inscription. I think she thumbtacked Gene to the wall — anathema to collectors, but to me those loving damages are an indication of how eager and enthusiastic she was about the subjects, their music, and her brief connection with them. When we die, the fate of our physical selves is fairly clear, no matter what plans we may have made. Will our precious possessions end up on eBay? That is another question entirely. Thank you, Audrey, for being such an enthusiastic Swing fan. Late last year, I did one of my periodic eBay browsings, which have provided many images for this blog. The items below are no longer for sale, but the images are available for us to linger over. In HERE AT THE NEW YORKER, Brendan Gill told a story of showing his friend, the writer William Maxwell, a Roman coin he had bought, and Maxwell thoughtfully saying, “The odds are on objects.” A cryptic utterance, but my time spent on eBay suggests that Maxwell was right. For one thing, objects are longer-lived than their owners, and they are put up for sale. These thoughts are motivated by yet another visit to that site — in this case, to a “store” which has folded its tents as far as jazz and big band collectors are concerned. But they offered these four artifacts for sale. The seller knew their value: the prices ranged from $279.20 to $2,399.20. But looking is free. That’s an authentic signature (to me) even if Louis didn’t have his pen, filled with green ink, on hand. What I would like to know, of course, is the name of the person who advanced Bird the money — not a small sum in 1950. Whether Bird actually went to the doctor, and for what reasons, I leave to you. Since none of these objects is as durable as a coin, it’s marvelous that they have survived. Did their owners keep them safe for love of Louis, Jack, Miles, and Billie, or because of an awareness of their monetary value? Or both? I can’t surmise, but I am glad that these things exist for us to look at, and perhaps own. To the right of me, next to this keyboard, I have an index card that Louis Armstrong signed for me in April 1967. And I’ve seen many examples of his angular handwriting, the idiosyncratic crabbed loops and slurred letters that a person who signs his name millions of times does. I love eBay and visit it often — sometimes to purchase an out-of-print CD or book, sometimes to browse. Readers of this blog know that I have returned from my time at the monitor with surprises that I share. And, by the way, the writer’s love for Poppa Bing is also genuine. I love that the seller identifies Louis as “(DEC’D) TRUMPETER. Above is a genuinely warm inscription to Chris Clufetos, known better as Chris Clifton, whom Louis befriended. Are you beginning to get the idea? Now, does this signature below resemble the others? Now, here’s the real thing. Forget that some eBay sellers know that the average buyer is trusting and perhaps naive; forget that some people on both sides of the deal are not well-informed. Good luck! Anyone can use a green pen, but there is only one Louis. Keep hustlin’ and bustlin’ for the real thing. Make your dream come true. I’ve been eBaying once again — cyberspace’s version of going to antique stores in person — and I found four intriguing objects, all musical. 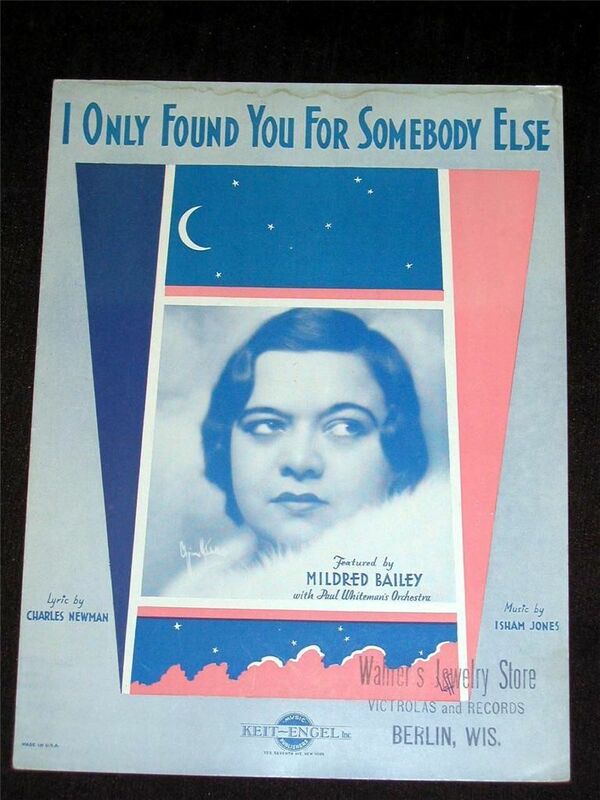 but the intriguing part of this cover (it might have been a very good song, given the credits of Isham Jones and Charles Newman) is the store listing, bottom right — a jewelry store that sold victrolas, records, and music in a town in Wisconsin. Evidence of a wondrous and now vanished past. 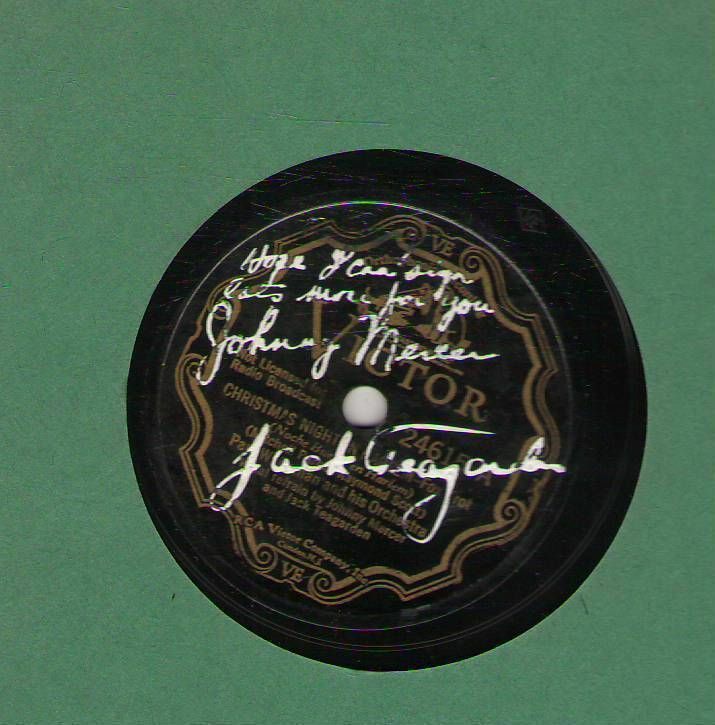 The jazz versions I know are Jack Teagarden and Art Tatum — both contemporaneous. Now, two discs. Autographed ones, from the collection of Bill Thompson. They were a wonderful team (I think not only of these duets but THE BATHTUB RAN OVER AGAIN, and LORD, I GIVE YOU MY CHILDREN). And the prize. Was George French or was Louis being Louis? I think that is positively begging to be made into a t-shirt, but I picture people coming too close, squinting at it, and asking for explanations, so this idea may have to go in the basket where the almost-good ideas are kept. That assemblage comes from the Benny Goodman Orchestra in early 1941 (February – March): Charlie Christian, electric guitar; Jimmie Maxwell, trumpet; Mike Bryan, guitar; Skippy Martin, alto saxophone / arranger; Pete Mondello, tenor saxophone; Cootie Williams, trumpet; Dave Tough, drums. 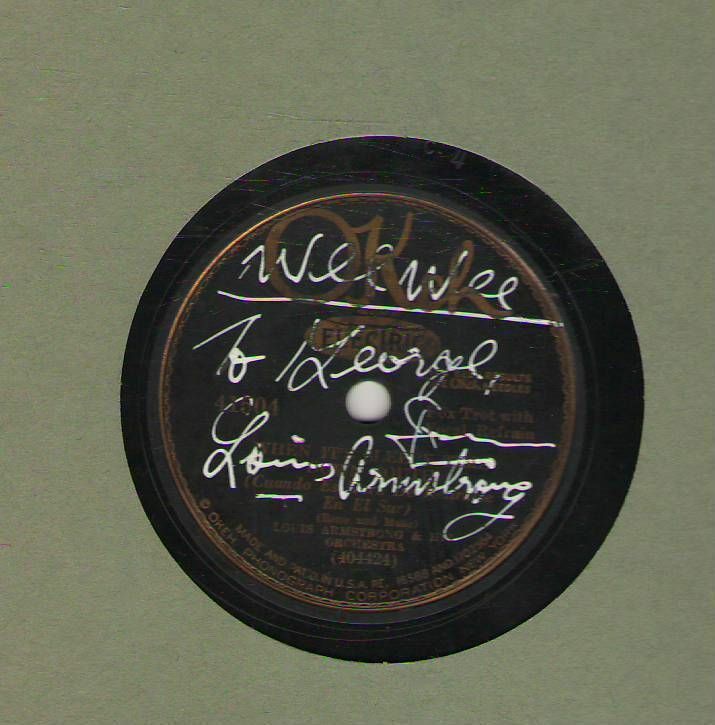 I first saw this browning piece of notebook paper as part of the Larry Rafferty Collection: someone no doubt has bought it by now but there’s no reason JAZZ LIVES can’t share the image with the Faithful. I don’t hear the string bass of Artie Bernstein, but do I hear the voice of John Hammond early on? “Mop!” is our man Cootie Williams. This is music — like a deep pool — that one could descend in to for a long time. Bliss that it was recorded at all, and even better that the whole rehearsal / informal session did survive, was issued in several formats (Meritt Record Society and Masters of Jazz, vinyl and CD). 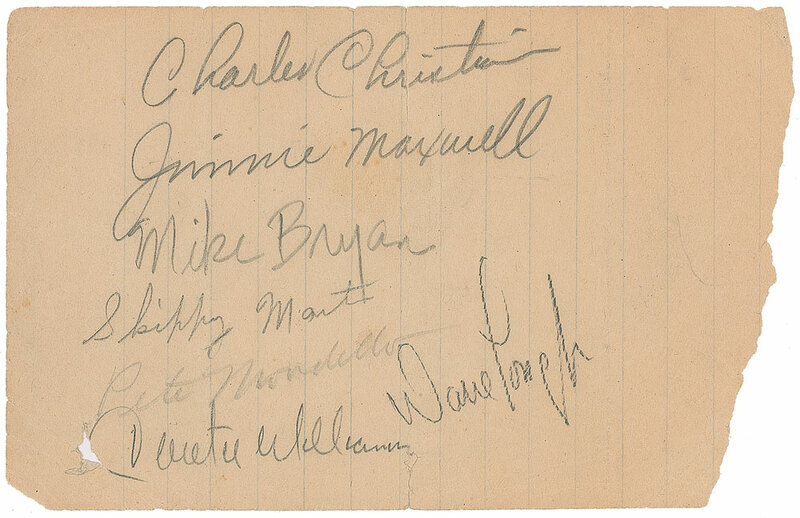 A year after he signed this paper, Charlie Christian (1916-1942) was dead. Even the most astute jazz historians sometimes assume that jazz was played primarily in a half-dozen cities, their names familiar. But in the Fifties and Sixties, there were many opportunities for famous musicians to tour, to touch down at clubs we haven’t heard of, for a week or so. The photograph below came from Walt Gifford’s scrapbook, was passed on to Joe Boughton, and made its way to me after his death. I believe that this was taken some six decades ago, somewhere in what New Yorkers and Californians would call “the Midwest,” which could have been Cincinnati, Milwaukee, St. Louis, or Columbus, Ohio. 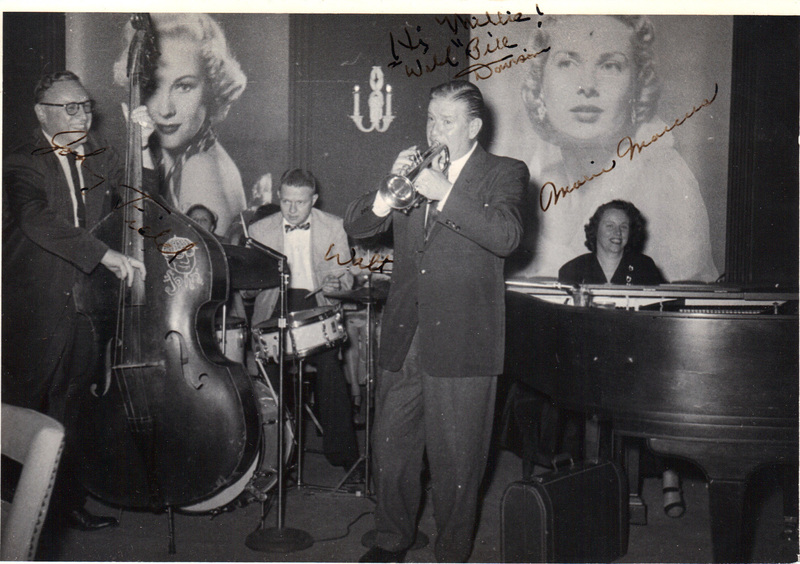 The quartet, from the left, is bassist John Field (well-known in Boston), Walt at the drums, Wild Bill Davison, cornet; Marie Marcus, piano (a pioneering jazz player, not all but forgotten, unfortunately). You can imagine how good they sounded. “Hi Waltie!” to be sure.